I have never, in all honestly, been much of a fan of porridge, but every now and then I find myself craving it. There’s something about how warming it is, and perhaps the memories attached to it from my childhood, that I love, and I do find it keeps me fuller for longer. If I’m being super, super healthy, I’ll force down a very simple and plain recipe using water, not salt and no sugar, and I’ll top it with fresh or stewed fruits. But if I’m feeling a little more indulgent, or if I’m cooking for guests, I’ll get more creative and I’ll swap the water (or 1/2 of it) for a plant-based milk (to make it more creamy), and I’ll flavour it will all kinds of funky things. See below five of my current faves. This variation is super creamy, but essentially, you could use any milk or plant-based milks if you don’t have oat milk. As with any porridge, the toppings are really the main attraction. I’m not really here for a bowl of plain porridge with a little salt here and some sugar there. I’m here for the party thats going on on top and, in this case, it’s sesame themed so come prepared; sesame oil, tahini and sesame seeds. But, by all means, run with your own theme, get seasonal or use your usual go-to favourites. As you wish! Start by soaking the oats. Place the oats in a small to medium bowl, then cover with 100ml oat milk (or other milk or plant-based milk). Ideally use enough milk to just cover the oats. Leave to soak for a minimum of 2 hours, ideally overnight. 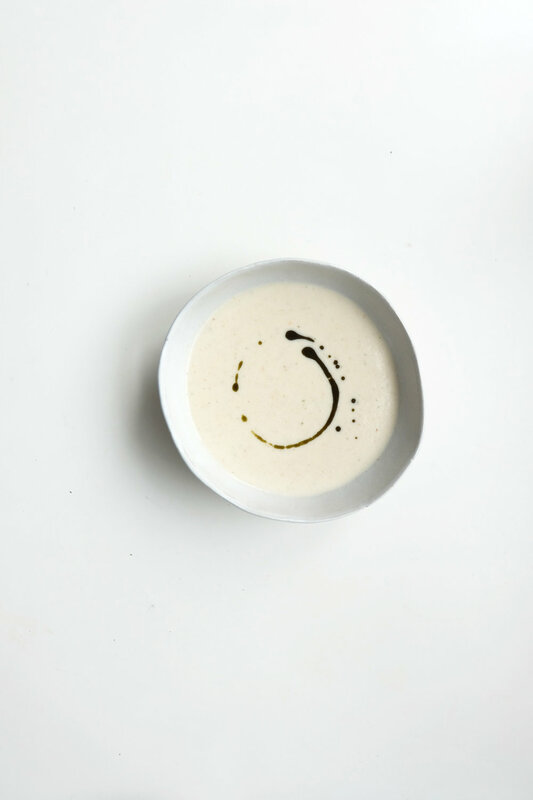 If you don’t have time to soak the oats, or once the oats have been soaked, transfer to a medium saucepan set over a medium heat, and add the other 200ml oat milk (or other milk or plant-based milk), along with 200ml water. Bring to the boil and then reduce to a simmer and cook for 15-20 minutes, until the liquid has been absorbed and the oats are soft and creamy. If the mixture becomes dry too quickly, add another 100ml water, and stir to combine. After a few more minutes, add another 100ml water if needed, and keep adding until you are happy with the consistency. Once happy with the consistency, portion into bowls (if making just 1 serving, leave the rest in the pan for now and save for another day). Add the toppings or any other toppings of choice and enjoy, preferably piping hot. This variation is definitely a new favourite. I love turmeric in most things, but this is like a turmeric latte in porridge-form. It’s great! I also know from previous research that black pepper helps the body assimilate (that’s absorb, to you and I), turmeric’s nutrients, and to ensure the body is making the most of what the turmeric has to offer. It doesn’t really alter the flavour too much, and adding honey is a nice way to add a gentle sweetness. You’ll notice a variation topped with a knob of butter which is something my parents used to do when I was a kid. It adds a subtly salty flavour and the fat enhances the nutritional profile, and will see that fat-soluble nutrients are assimilated. The sesame seeds and flax are just what I had on hand at the time, but you could of course add other nuts and seeds along with other toppings, such as fresh or dried fruit. Grated fresh turmeric would be a nice touch too. Jus sayin’. Ideally, soak all of the porridge ingredients, apart from the water, overnight or for at least 2 hours before cooking. Then, simply transfer the mixture to a medium saucepan set over a medium to high heat, add the 250ml water and bring to the boil. Once boiling, reduce to a simmer and leave to cook for a further 10-15 minutes, until thick and creamy. Add extra water, as needed, if the mixture seems too dry or too thick. If you don’t have time to soak the oats before cooking, simply place all of the ingredients in a medium saucepan over a medium to high heat. Stir to combine then bring to the boil. Once boiling, reduce to a simmer and cook for a further 10-15 minutes, until thick and creamy. Add extra water, as needed, if the mixture seems too dry or too thick. Start by making the pine nut milk. Blend 100g pine nuts (either raw or toasted) with 200ml filtered water, until smooth. This bircher is my favourite thing to make if I’m in a rush, as it is highly energising, filling but not too filling, and takes just minutes to prepare. The caramelised banana porridge is something I’ll make it I have guests who’ve slept over or who are joining me for brunch. It takes a little extra effort but its so worth it. The flavour of the caramelised bananas paired with the creaminess of the porridge base is out of this world. Start by slicing the bananas, preferably length ways, but will also work sliced into rounds. Heat 1 tablespoon of the coconut oil in a frying pan over a medium heat, and then fry the banana. Fry for a couple of minutes on one side, then carefully flip using a tongs, a spatula or a fork (they may become quite soft and hard to handle). Once the banana begins to caramelise and brown, remove from the heat and set aside. Next, heat the remaining oil in a medium saucepan over a medium heat. Add the cinnamon, vanilla and then the oats and stir to coat. Cook for 5 minutes and then add the milk. Stir to combine, bring to the boil then reduce to a simmer. Take half of the caramelised bananas and mash it into the porridge mixture, whilst still on the heat. Add a splash more milk or water if the mixture becomes too dry or too thick. Stir to ensure the banana is combined, and then leave to simmer for 15-20 minutes. The longer you leave it the the more creamier and softer the oats will become. Once you’re happy with the consistency, top with the remaining caramelised banana and finish with natural sweetener (if needed) and a pinch of salt. You could also add knob of butter, vegan butter, ghee or coconut oil, a selection of chopped nuts or seeds, fresh, sliced banana and extra cinnamon. Place the oats in a large bowl and cover with the plant-based milk. Chop the banana into the bowl and use a fork to mash it into the oat mixture. Add the cacao, maca, seeds, natural sweetener and salt along with any elevational extras of your choice, and mix to combine with a fork. If the mixture seems dry, add a little more milk. If it seems too wet, add a small handful of extra oats. Leave to soak for 5–10 minutes (or longer if you have the time). Top with any or all of the serving suggestions above. WITH WINTER IN FULL SWING, THE DAYS ARE SHORTER, DARKER AND HARSHER, YET OFTEN WE FORGET TO TAKE THE TIME TO ADAPT OUR LIFESTYLES IN ORDER TO SURVIVE THEM. 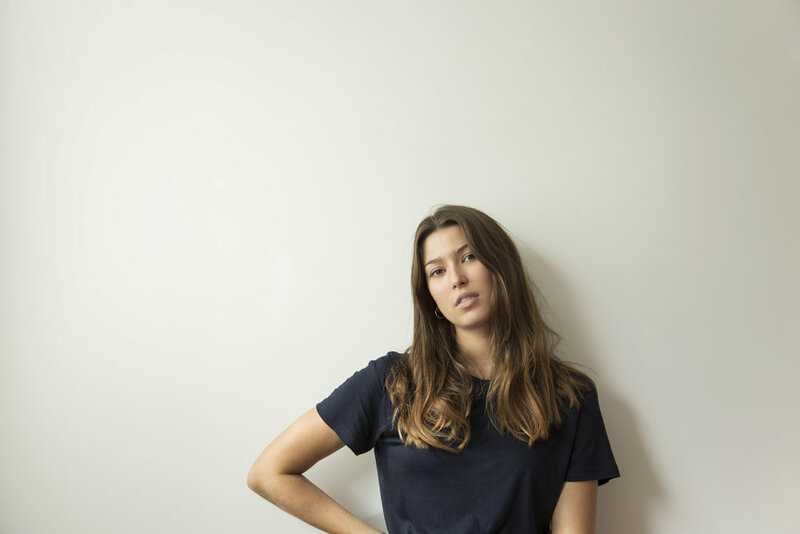 LONDON-BASED NUTRITIONIST DANIELLE COPPERMAN SHOWS US HOW. Whilst we take care to brace ourselves for the freezing conditions (think more layers, bigger boots and larger coats), too often we forget to consider the areas of our lives impacted by the cooler weather other than our wardrobes. Instead, we carry on our lives as much as normal, trying to power through and forcing ourselves to continue our usual lifestyles whilst enduring winter’s side effects (such as low energy, low moods, low motivation, skin issues and much more). For me personally, when the seasons change (and especially during the shift from summer to autumn/winter), I try to make small changes to all areas of my life to help me continue to thrive. Make space for little moments to pause, take a breather and tune in to acknowledge and honour my energy at least once or twice a week – especially if there’s a lot going on in my life socially or with work. Sometimes, it’s important to learn how to say ‘no’ and the winter is a wonderful excuse for this, so use it! These little life hacks make a big difference in my life. Struggling to find the mojo to make it through to the summer with as much energy, inspiration, motivation and positivity as possible? We have cravings for a reason and our cravings speak to changes in our activity level, physiological responses and environments. We crave carbs when we’ve worked out or run or walked for miles. We crave sugar if our blood sugar levels are dipping too low. We crave salt if our blood sugar levels are too high. Similarly, at different times of the year and in different climates, we need different things from our food, and nature knows that. It prepares itself for the ingredients that our bodies really need to flourish, and in winter, these foods are usually ones that keep our immune systems strong and keep our energy levels high. They’re also usually warming and grounding. At the beginning of the year, my seasonal cravings usually include Brussels sprouts, apples, cabbage, chestnuts, mushrooms, dark leafy greens, earthy roots (like carrots, parsnips, pumpkin and beets), blood oranges and grains (like brown rice, quinoa and buckwheat). I tend to prepare more cooked meals during these colder months as they are easier on our digestion, warm us internally and support circulation. I also try to incorporate apples or citrus fruits into most of my days too, for their abundance of vitamins to protect against viruses. I also ramp up my adaptogen game during the colder months and add in some new ingredients to replace those I need during the summertime. Adaptogens, herbs and spices play a major part in my daily diet and I find the easiest way to use them is in smoothies or stirred through hot or cold water or plant-based milks. During the winter, I love the SUPER ELIXIR with cacao, mucuna puriens, ashwaganda, cordyceps, reishi, shilajit and maca that really do wonders to keep my energy levels and moods high (as well as keeping those dreaded winter illnesses at bay). My skin always suffers during this time of year and becomes incredibly dry, fragile and sensitive, so I always make sure to switch my lighter and usually water-based summertime products with denser and oil-based products. I also exfoliate less (and use more gentle products when I do) and cleanse as usual. Once a month, I also do a steam with essential oils and throughout the season, I use all-natural, organic products made with whole ingredients (without nasty additives or chemicals) and most importantly, lots of natural oils (such as coconut, almond, shea, cacao and essential oils). If you suffer from dry skin, I’d highly recommend using more oil-based products - or even just pure carrier oils - as they are gentler on the skin whilst providing rehydration and bringing balance back to your complexion. Many people falsely believe that oils will make their skin greasier and blemish prone, but this couldn’t be further from the truth. In addition to being nourishing, these natural oils are often antibacterial and antiviral too and as such, keep skin clean. During the winter, one of the most important rituals to incorporate into your routine (at least a few times a week, if not daily!) is movement. It’s so important to keep things moving and keep your circulation in check with supported blood flow and oxygen intake. If you can’t bring yourself to work out or if it’s just too cold for a run, try to walk places as much as you can. Walking is enough to get your heart rate up so it’s a great option for those who struggle with finding the time or motivation for more strenuous activity during winter. It’s super important to find ways to move that are still gentle and not too stress-inducing, as this is a time when most other animals are hibernating… and to some extent, we should be too. But it’s important for us, as we continue to go about modern life and our daily responsibilities, to keep things moving. You’ll feel better mentally and physically for it! Other rituals I like to practice during the winter and particularly at the beginning of the year in January include setting intentions and journaling. This really helps me to reflect on my achievements from the year, focus on what I have and note what I am grateful for – as well as helping me map out my goals for the year ahead. I also like to use tarot cards or oracle cards if I’m feeling particularly lost, stuck or unmotivated in life. These cards can help to give you a sign, a message or just a nudge in the right direction, and you don’t have to be a pro tarot reader to use them. It works by simply putting your energy into the deck of cards and asking them questions on things you want to know or need some clarity or guidance on. I love this practice and even if it seems a bit ‘woo woo’, if nothing else it helps you to become present and grounded and always gives positive and inspiring information. This one’s going to hurt, but it’s actually really good for us - mentally and physically - to be exposed to the cold… not for a long time, perhaps, but for short intervals. That’s why during this time of year, I try to take interval showers a few times a month, which means standing under cold water for 1 minute then returning it to warm water and repeating a few times. It’s like cryotherapy in your own home. On the other end of the spectrum, it is of course super beneficial to be warm too, and so I’d suggest saunas or steam rooms to be incorporated into your rituals, at least once a month if you can. When I’m in Sweden visiting my boyfriend, there are places you can go to jump naked into an iced-over lake, and then run quickly (with a robe of course) into a sauna nearby. It’s so invigorating, revitalising and energising and is a wonderful way to move energy, shift blockages and keep your metabolism active. Danielle Copperman is a qualified nutritionist, food writer and chef based in London. She is also the founder of QNOLA. You can also find Danielle’s book, Well Being, on Amazon. Earlier this winter, I shared my winter wellness tips with Glasshouse Salon - one of my favourite natural / organic hairdressers and beauty salon. Find out how I keep well during the colder, darker months, below. What do you do during the colder months to boost your immune system? Do you incorporate different things that you might not use during the spring/summer? Yes, totally. Naturally, my body craves different kinds of foods this time of year. I never used to pay much attention to it but as I become more aware of locally seasonal foods, its super interesting to notice how my preferences adapt. I don't know if its tradition and comfort as the temperatures drop, but i start to crave more root vegetables, dark leafy greens, citrus fruits, spices, curries, soups and broths, as well as tea on tap. So in that sense, i incorporate different ingredients into my diet and cook very different (more hearty and grounding, but also energising) meals. I also take more supplements (like vitamin D, 5 HTP, multivitamins, omega fish oils, zinc, copper, probiotics - depending on how I'm feeling) to support my body's natural immune response. And i continue to drink lots of liquids - lemon and ginger, water, charcoal in water, spirulina in water, greens powders and more. I think the more antioxidants the better. It's also useful to know that sometimes, depending on the type of illness (cold/flu or sore throat or headache) will depend on which remedies work for you. Last christmas my sisters and I were all ill with sore throats (it often happens when we fully surrender and relax and our bodies just shut down! ), and we were chugging ginger tea like there was no tomorrow. but it was actually aggravating our throats more. So don't just follow what you read. Do some research and use more gentle herbs, rituals and rest whenever you feel the onset of any ailment. In terms of beauty, I change up my routine slightly as things like colder, drier weather, heating, wearing layers and more viruses in the air tend to aggravate it. I stick to the same fundamentals mostly, as i find my skin gets confused if i change my products too often - and if your regular products are natural and pure enough, they should have a variety of adaptable properties and functions that can provide for all kinds of situations, skin-types and seasons. But I will stop cleansing my face too much with water-based products (as they are more drying), and I tend to use much genteel exfoliation processes, and much fewer masks (changing to sheet masks which I find more hydrating and moisturising). I like to let the natural oils of my face stay as balanced as possible and so i try not to over-wash. I think we over-wash so much these days, that our skins normal and natural PH, oil levels and immunity gets out of whack. If you wash your face less I find the skin is trained and more prepared to cope with bacteria and dirt, as the oils of the skin are our natural protection against these things. It's only really when you've been wearing make up that you need to cleanse thoroughly. A parting note would be not to be scared or sceptical of oils, as i think many people assume they will make the skin oilier. i wear an oil to bed almost every night, and as long as your diet is in check and you are drinking plenty of water, you won't find that natural oils contribute to blemishes or clogged pores like you think they will. what clogs pores is dirt, not powerful and functional ingredients from the earth. Oils are full of essential fats (for cell growth, elasticity and renewal), as well as antioxidants and are antiviral, antibacterial and much more. I use oils as my body moisturiser too, and dry brush to encourage circulation, lymphatic drainage and to remove dead skin. Rituals I use to elevate my immune system include yoga, movement and pranayama. Pranayama can be really cleansing for the organs and also ensure that breathing is regulated and youre sending enough oxygen around the body for vital functions. I also find movement is vital in order to keep the body feeling alive and active. I use meditation and pranayama to enhance my energy levels this time of year too, as well as yoga and other exercise. I do tapping and shaking (both rituals from my book, Well Being) in the mornings to encourage circulation, to reduce muscle tension and to warm up the body. Hot baths are great when it gets colder, as they regulate temperature. Better more, use a potent mineral-based bath soak to restore essential vitamins and hydrate. I also turn to massage more in the colder months, as the drop in temperature can lead to aching or tight joints, muscle tension and poor circulation. I have the worst circulation and am a cold person most of the year, so in the winter i get really cold hands and feet and my fingers occasionally go completely numb and lose their colour. I use oils on my body to give myself regular massages (especially on my hands, legs and face), to encourage circulation and lymphatic drainage. I truly believe that illnesses are an indication of a much deeper emotional / mental / energetic / chakral issue. There is so much to learn in this area and it sounds pretty woo woo but it makes perfect sense to me. When I'm anxious or stressed, I always reach burnout and my body just shuts down to show me that i'm trying to make it operate at a pace that isn't normal, and to really force me to stop. When i recently felt super low-confidence, fearful and a little uncertain, I had a sore throat and my chest was tighter than ever. I went to an energy healer and she told me sore throat was associated with not speaking your truth and intense worry. And in the past I have had migraines when i've been too in my own head with thoughts and not living in the present moment. The body is so clever, so if you do feel something coming on, take time to pause and really tune in. Then the real healing can begin. It may not always be something that can be healed with food, supplements or rituals. Although, often at this time of year, illnesses are virus or bacteria based (especially in over-crowded cities), so sometimes its unavoidable and nothing personal at all! Just be aware and then you'll find what you need. A round up of some of the most festive recipes that have featured on the site over the years. Happy Holidays one and all! I improvised with this recipe in desperation the day before an event I hosted last weekend, and thank god they turned out to be a huge win. I always loved gingernut biscuits as a child, and so it is with great pleasure that I present to you this healthier and all-natural variation, which, IMO, is better than the shop-bought ones I used to crave. These biscuits are so crunchy and bake to perfection, and unlike most processed biscuits are a) only gently sweet (and only sweetened with natural and nutrient-rich sweeteners) and b) gluten-free and c) made with only 5 main ingredients, and absolutely no additives / flavourings / preservatives or anything else funky you wouldn’t recognise. I personally love the ginger, but you could also leave the ginger out and / or swap for other spices (such as cinnamon, vanilla or cardamom). Start by making the biscuit. Combine all of the ingredients in a food processor until they form a crumbly dough. The mixture should stick together compactly when pressed with the back of a spoon or spatula, or when squeezed between your fingers. Tip the mixture out onto a flat baking tray. You can grease the tray with a little coconut oil, but I didn’t feel the need to, and the biscuits didn’t stick. Spread the mixture out evenly across the baking tray and then press down with the palm of your hands, your fingers and fists - whatever works for you. The aim is to make the mixture completely compact, pressing it together and spreading it evenly to about 0.5mm in thickness. Pat the mixture and bring the sides in as much as possible, then when the mixture is as flat, even and compact as you can get it, use a sharp knife to gently slice off the edges (which will look slightly uneven and loose) to make them clean-cut and straight. Next, use the same knife to gently score the mixture into biscuit shapes. I use the knife to make small rectangle shapes, but you could make squares or other shapes, or use a cookie cutter if you’d prefer. Ensure the knife cuts through to meet the baking tray rather than just lightly scoring the mixture, as this will make it much easier to break the cookies apart when they have baked. Place inside the pre-heated oven and bake for 12-20 minutes. The baking time will depend on the thickness of your biscuits. Just keep an eye on them after 10-12 minutes, and if they still feel a little soft, leave them baking for a little longer. The edges should begin to brown slightly. If you aren’t sure if the biscuits are done, try to break an edge piece off and leave it to cool for a few minutes before testing. It should be crisp and crunchy, and ideally not chewy - unless you prefer them a little chewy in which case, remove from the oven slightly earlier. When you are happy with the baked texture, remove from the oven and allow to cool for a few minutes before carefully breaking the biscuits apart along the lines / cutter shapes you made before baking. Set aside on a cooling rack to cool whilst you prepare the chocolate. To make the chocolate, fill a small saucepan with water and bring to the boil. Place a heatproof bowl on top of the pan (creating a double boiler), then add the cacao butter and salt. Once the cacao butter has melted, remove from the heat and whisk in the cacao powder. Add your natural sweetener and whisk again, until combined. Allow to cool for about 5-10 minutes ideally, and then, one by one, dip the biscuits into the chocolate, on one of the flat sides only. Place immediately in the freezer on a tray or plate, and repeat until each biscuit as been dipped. After about 5-10 minutes in the freezer, double dip, to get a thicker layer of chocolate. This time, before placing in the freezer to set, sprinkle with your crushed nuts and fruit - if using. Then, this time, place in the fridge in an airtight container to set and store them hear until ready to eat (you can also store at room temperature but the chocolate may soften a little, depending on the temperature of the surrounding area). For someone who doesn't usually like mince pies, I ended up eating 3 of these for breakfast the day after I made them. The pastry - which is free from gluten, dairy and refined sugars, and made from all-natural, nourishing ingredients - is the perfect texture; not too crumbly; not too sweet; just doughy enough; and with the perfect amount of crunch. The filling - which is also free from gluten, dairy and refined sugars, and made from all-natural, nourishing ingredients - is also much more flavoursome and juicy than other shop-bought mince pies i've tried. I add superfoods such as blueberries and goji berries to mine, which bring a unique flavour and also additional nutrients. The apricots and dates add a really rich flavour, and mean you don’t need to add extra sugar or sweetener to the filling mixture. Combined with the natural citrus juices and spices, it’s an unbeatable combination. Granted, its easier and often more appealing to buy mince pies from the shops, and these do take a little time and effort to make, but isn't that what Christmas is all about? Taking time, taking care and enjoying the process of each stage of preparation. It's tradition, after all! But, hey, I hear ya. Theres always enough to do, so to avoid having too much on your plate (so to speak), I'd suggest preparing these a few days (or weeks - as they freeze well) before the festivities begin, to reduce stress and take the pressure off. I'd also suggest getting children involved too, as they will love getting creative and helping. Grease a muffin tin with a light coating of coconut oil. For the crust, place all of the ingredients -but only half of the flour - into a food processor. Blend to combine, until the ingredients form a crumb-like texture then transfer to a mixing bowl. Add the remaining flour and stir with a wooden spoon or spatula until combined. Add a little more flour if the mixture seems too sticky, and add a little more syrup if it seems too dry. Knead the dough out onto a lightly floured surface. Use a rolling pin to roll the dough out until it is about 3mm thick (I do this in 2 stages, using half of the dough at a time). As you roll, gently apply pressing, pressing down onto the dough as you roll it. This ill help to ensure the dough stays together and compact and doesn’t crumble or separate. Next, use a round cookie cutter to cut out individual crusts, and use a thin spatula to lift the dough discs if they stick to the surface. Lay each circle into each section of the greased muffin tin. Leave the leftover dough for the lids. Bake for 8 minutes until the crusts begin to brown, but aren’t cooked through. Whilst they cook, prepare the filling. For the filling, simply place all of the ingredients apart from the chia seeds into a medium saucepan on a medium heat. Bring to a gently boil, stirring constantly. As the blueberries soften, burst them with the back of a wooden spoon and then reduce to a simmer. Simmer for 20 minutes, until the fruit (particularly the apple) has completely softened. Add the chia seeds just before you take the mixture off of the heat. Leave the mixture to cool slightly and allow a few minutes for the chia seeds to swell and absorb some of the flavour. Take about a tablespoon of the mixtures and fill each pre-baked crust. Roll out the remainder of your dough and use either the same round cookie cutter or a more fun, festive one (like a star, a Christmas tree or holly leaves). Take each shape and arrange it on top of the mince mixture. If using another circle, I like to seal them by pressing a fork around the edges to connect them to the crusts. But if using a shape, you can just rest it on top of the fruit mixture. * At this stage, you can use 1 egg, whisked, to brush on the pie tops. This gives them a more glossy finish. Return to the oven and bake for a further 10-12 minutes, until the pastry turns a golden brown. To serve, dust with buckwheat flour or desiccated coconut (or icing sugar if you prefer a sweeter option), and serve with coconut cream, runny almond cream and with an extra dollop of the fruit filling if you had some left over. Ah, I’m excited to share this one with you and I really, really hope you make it. This was an impulsive experiment last week, to keep me occupied whilst cooped up indoors with my first proper cold in years. A few days prior, my sister had mentioned a really good mango tofu curry she’d been making on repeat recently, and I immediately wanted in. Not only are the days getting shorter, the evenings darker and the weather, well, worse, we’re also all more prone to illness this time of year. There are more viruses in the air and our immunity weakens as the weather gets colder. We need more from our food and we need different things from our food. 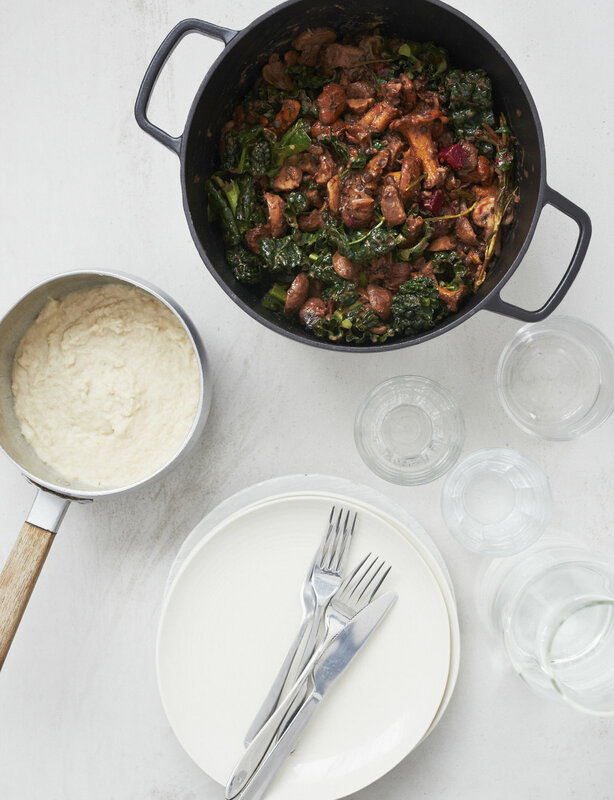 Warming and soul-soothing stews, one-pots, dahl’s and curry’s replace light and refreshing summer salads, snacks and light meals. We turn to more heartier meals using more grounding and deeply nourishing ingredients. This curry in particular is abundant in all kinds of spices, which have been used for decades in many traditions for healing from within. Needless to say, it really sorted me out and lifted many of my symptoms in under 24 hours. I’m aware that mango isn’t the most seasonal ingredients right now here in London, but it adds such an incredible flavour and texture to this dish. You could omit it or replace it with something like banana (trust me), apricots (fresh or dry), or other fruits or vegetables if you want something a little more inline with October. I made two variations of this; one Indian-style korma and one Thai-style green curry. My favourite is definitely the korma (pictured), but the Thai-style green curry is delicious in an entirely different way. It’s a little lighter and more refreshing. This recipe is a total crowd pleaser, and quick and easy to make, is ideal for busy weeknights or batch-cooking and filling the freezer on weekends. You could double the recipe anytime you make it and keep some in the fridge for the rest of the week, and some in the freezer for instant ready meals. * I can’t eat garlic or onion due to an intolerance, so I tested this recipe without them as well, and, for anyone else in a similar position, it works perfectly well if you’d prefer not to use them. Start by heating the oil in a frying pan and, once hot, add the onion, garlic, tofu and courgette. Stir fry for a few minutes, flipping continuously, and then add the mango, tomato paste (or tomatoes), fresh chilli and spices. (You could also blend the onion, garlic, tomato paste, fresh chilli if using and spices in a small spice blender before cooking, or dice / mince the onion at least, as it a nicer texture in the sauce than having them as large chunks). Either way, fry for about 10 minutes, until fragrant and until the tofu is beginning to brown and crisp on the outside. Next, add the lime juice and then the coconut milk. Stir to combine and then add the ground almonds. + Now would be a good time to put some brown rice or other grains on to cook, to serve with your curry. Bring to the boil then reduce to a simmer and cook for about 10-20 minutes, until the sauce reduces and thickens. Add a splash or water if the mixture becomes too thick for your liking. I personally like the sauce thick, but added a little water to loosen it a little before serving. Lastly, transfer to bowls and serve over your chosen grain. Top with a pinch of fresh coriander and a handful of sliced almond. Start by heating the oil in a wok or frying pan. Fry the onions and garlic for 2-3 minutes until fragrant and beginning to brown and then add the tofu and courgette or aubergine. Fry for 5 minutes, until the tofu begins to brown, and then add the mango and the chilli. Next, stir in the spices and ginger, followed by the lime juice, tamari and rice vinegar. Stir to combine and then add the coconut milk and seaweed. Stir again and bring to the boil, then reduce to a simmer and cook for 10-15 minutes. Season, to taste, and add extra chilli, chilli powder or flakes until you are happy with the flavour and spice. Add the fresh coriander and serve, either with brown rice or another grain or gluten free noodles. Whilst the rest of the world is apparently into blending cauliflower into smoothies, I'm keeping it savoury and, IMO, just as it should be, by blending it into a soup. To be honest though, you could definitely get away with adding some frozen banana and extra liquid to this for a sweet, creamy smoothie - if that's your jam give it a go and let me know how that turns out for you. I've always been big into soup and this time of year its not only perfectly fulfilling simplified nourishment, it's also warming and comforting - two very important factors when its snowing outside and you're back at home for Christmas with parents who like to ration the heating regardless. This recipe is so simple, and blending roasted cauliflower with rich coconut milk makes for the creamiest end result. To be honest, you could use pretty much any vegetables in place of or as well as cauliflower. I don't tend to like potatoes in soups as they become too thick and starchy for my liking, but by all means add them in if you want to bulk it out a little. I think it would work well with sweet potato too, but i'll let you be the judge of that. Nutrition: Cauliflower is highly detoxifying and cleansing and is known to improve digestion. As always, these nutritional benefits are general, and this may not ring true with you. I personally find cauliflower often affects my digestion for the worst, but I occasionally eat it anyway. The point is that unless the rest of your lifestyle is aligned and balanced, your digestion is not going to become flawless as a result of one individual ingredient. Cauliflower is also thought to be high in essential vitamins and minerals, however, depending on many other aspects of our individual lifestyles, these vitamins and minerals may not be bioavailable for all of us. Don't eat this purely for its nutritional promises, enjoy it and if it makes you feel good, enjoy it again, and again and again. + I don't cook with onion or garlic as I have mild sensitivities to both, which is why they are included here as 'optional'. I don't personally feel they are essential for adding flavour do this dish, but if you'd prefer, roughly follow the below measurements. Preheat the oven to 200-220c. Slice the cauliflower into individual florets and any difficult areas to cut, just slice into smaller, flatter pieces. Place in a large bowl and add 3 tablespoons of oil and a pinch of salt. Toss in the oil to cover and then pour out and arrange onto a baking tray. Once the cauliflower begins to brown and soften, remove from the oven. If using garlic or onion, heat the remaining oil in a medium saucepan over a medium heat and add both, stirring continuously for 4-5 minutes until they begin to brown. Transfer the cauliflower to a high speed blender and add the garlic and onion, if using. Add the remaining oil if you didn't use it to cook the garlic and onion, along with the stock, nutritional yeast and fresh herbs of choice. If you're using chickpeas, add those now, along with the apple cider vinegar and cinnamon, if using. Blend on a medium to high speed for 1-2 minutes until smooth, then transfer to a medium saucepan over a medium heat. Add the coconut milk and season to taste, then heat through and serve instantly. Top with a drizzle of olive oil, flax oil, chia oil or avocado oil or add a knob of coconut oil or ghee. Drizzle with raw honey or wheatgrass oil (see below). Top with savoury qnola, hemp seeds and crushed nuts. + You can also use this soup chilled as a dressing for salads or as a hot or cold dip for vegetables or bread. + You can also stir it through pasta as a creamy pasta sauce. Simply add it to a pan of cooked pasta, heat through, and serve with an extra sprinkle of nutritional yeast, or cheese if you aren't vegan or dairy intolerant. 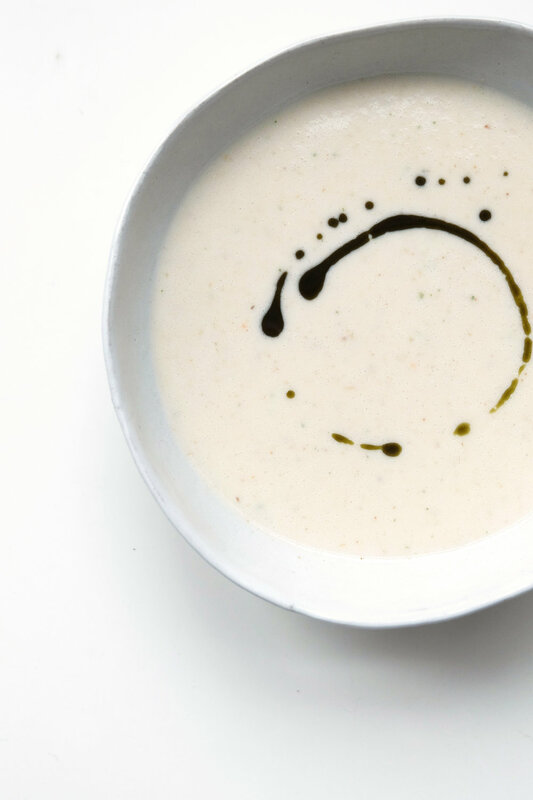 + You can also turn this into a risotto-style dish by simply adding cooked brown rice, quinoa, buckwheat or millet to the soup and cooking until the grains absorb some of the liquid. Simply add all of the ingredients to a small measuring jug, a mug, a glass or a jar and whisk with a fork or a small whisk if you have one. Season to taste the drizzle over the soup or use on salads, vegetables and to top other meals. In recent years, and especially as I become more in tune with nature, I have come to really notice a difference in all aspects of my life as the seasons shift. I don't spend too much time thinking about it, but when I stop to acknowledge my dietary patterns, cravings, thoughts, feelings, moods, emotions, body temperature and other physical and mental adjustments, I notice that most of them are changing in sync with the weather, the moon phases and the elemental adjustments of each season. Typically, pecans - although nowadays not especially seasonal as they are available pretty much all year round - are harvested from late September through to the end of November. Traditional Chinese Medicine teaches that nuts are warming and hot in nature and so eating nuts during Autumn and Winter is thought to help to keep us warm, internally. With their healthy fats, high protein content and abundance of vitamins and minerals, most nuts are known to nourish and strengthen the kidneys, the brain and the heart, which all need a little extra attention during the colder months as we become more susceptible to illness. This pecan and cinnamon butter is so simple yet highly effective, both nutritionally and energetically speaking. Cinnamon, a spice associated with the Fire element (which is the element of confidence and action, and which helps to cleanse and protect) adds extra warmth to this recipe, as well as adding aromas that can reduce fatigue and drowsiness - common side-effects of seasonal transitions into colder, darker climes. I've been enjoying this by the spoonful, stirred through breakfast bowls (such as Qnola and coconut yoghurt, chia seed porridge and smoothie bowls) and added to smoothies, tonics and adaptogen lattes. It's also delicious used as a dressing or blended into other dressings for savoury meals. 1. Preheat the oven to 160c. Spread the pecans evenly on a flat baking tray and once the oven is warm, place on a middle rack. Leave to toast for 10-12 minutes, until they begin to darken in colour and become aromatic. 2. Remove from the oven and transfer immediately to a food processor. Pulse for a minimum of 5 minutes on highest speed, stopping the machine to scrape down the sides, as required. The length of time required for the nuts to bind a liquified 'butter' will depend on the strength of your food processor. If necessary, pulse for up to 12 minutes until smooth. 3. Transfer to a jar or other pot and enjoy, or store in the fridge for up to 2 months. It doesn’t get much higher vibe than this lemme tell ya. If you’re looking for the ultimate hot chocolate recipe, I am telling you really truly honestly no bs, there's a good chance this is it. When I was growing up, I felt like I was on a lifelong quest for the best hot chocolate. It’s like finding the perfect brownie. Bad versions of either are still not that bad, but half arsed versions are disappointing and unfulfilling, especially when you know that better versions are out there somewhere. Your best option? Make you're own. 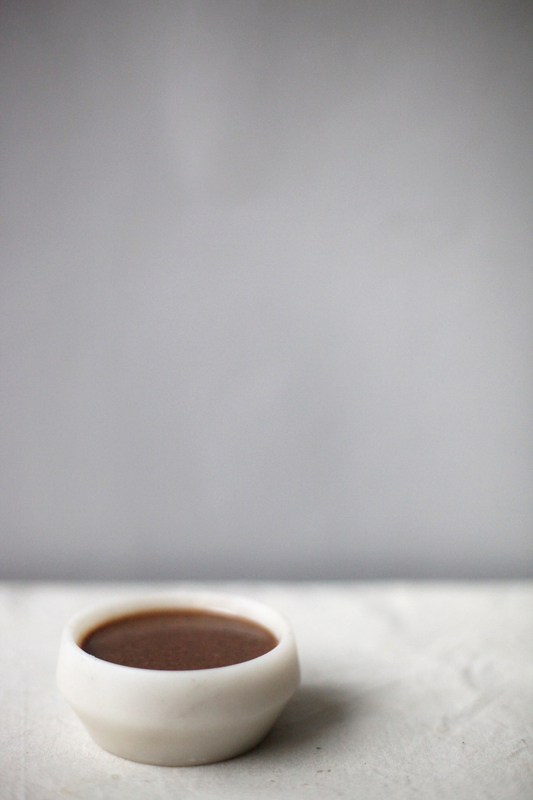 The kind of hot chocolate you want (or lets face it sometimes just desperately need) differs - just like anything else in your life - depending on how you're feeling and what you're going through. Sometimes I need a light energy boost so hot water and cacao powder - although not decadent or indulgent - does the trick. 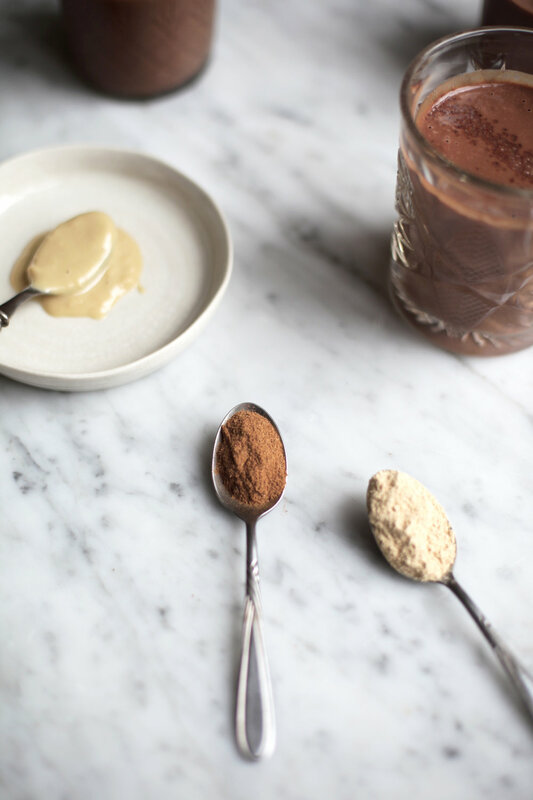 I often make a quick blend of cacao powder, nut or oat milk, vanilla, maca and a pinch of himalayan pink salt for something a little creamier and more filling as a lively energy hit that doesn't require too much effort. When I have more time and ingredients, I add soaked cashews to make a thicker, more intense option, but recently I’ve become sensitive to cashews (I think stress, or general cashew overdose, or both), and I know many people are allergic to nuts or wary of the calorie content, so I wanted to create an option that was less dense and less rich, and easy to be made nut free (depending on what milk and nut or seed butter you use). Although this recipe is less heavy, it's still quite filling, so if you’re catering for a movie night on the sofa and planning to down an entire glass of this after dinner, you may have some regrets (and you also probably won’t sleep because cacao is liiiiit). I’d go for this drink first thing in the morning, consumed instead of a smoothie (it is basically a hot smoothie), or mid afternoon if I’m hungry between lunch and dinner, and/or planning an evening workout. Quinoa is so high in natural plant proteins, amino acids and omega 3, so this drink is a functional option to support particularly active lifestyles. + Adaptogens are natural substances (often herbs, roots, vegetables or fungi) that help to decrease cellular sensitivity to stress. They go one step further than superfoods which are known as nutritional powerhouses, by actually helping with internal balance, mental and emotional activity and biological calm. I'll share a full post on them and their benefits in the next few weeks, but in the meantime, experiment with the ingredients in the Elevate It list, which I've listed as optional additions, as some are quite uncommon and difficult to source, and just might not be everyones jam. If you haven’t already cooked your quinoa, do so now as per the packet. If it’s loose and unpackaged (yay, good for you!) i generally bring 1 cup quinoa and 2 cups water to the boil and then simmer for 10-15 minutes until the water is completely absorbed. Halve the cooking quantities if you don’t want so much leftover quinoa, as 1 cup of raw quinoa will over double in size and this recipe only calls for 1 cup of cooked quinoa. Once cooked and cooled (you can rinse with cold water to speed things along) add to a high speed blender with all the other ingredients. Blend on a medium speed for 30 seconds then on the highest speed for 1 minute, until the mixture is completely smooth. Taste and season, adding more superfoods, salt or dates to suit your tastes, then transfer to a saucepan and heat, whisking, over a low - medium heat. If the result is too thick, add a little extra nut milk or water to thin to your tastes. Serve piping hot. Top with himalayan pink salt, qnola of choice or any superfoods / spices you used in the recipe, or decorate and infuse with fresh rosemary, dried rose petals or chamomile flowers. 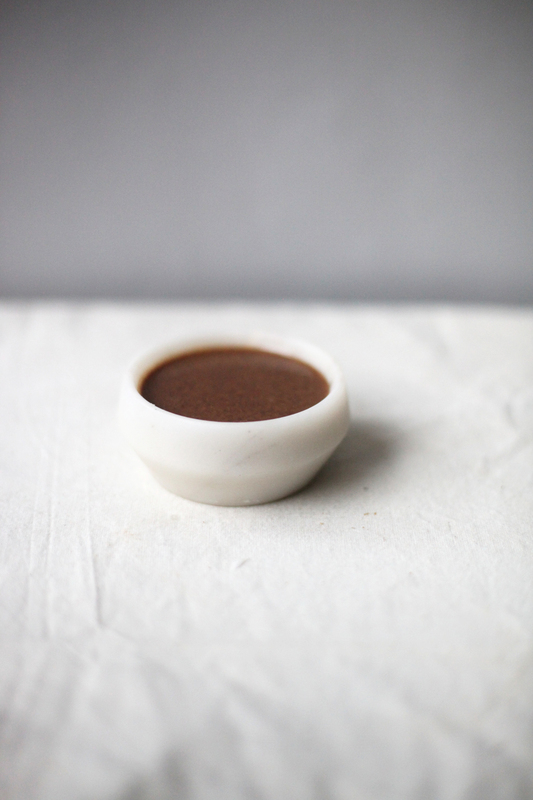 + Try also using less liquid to make a thicker result, which can be used as a chocolate sauce (or a custard if you substitute the cacao powder) for desserts.